Make money with Bitcoin at your favorite exchanges trading faster than anyone! 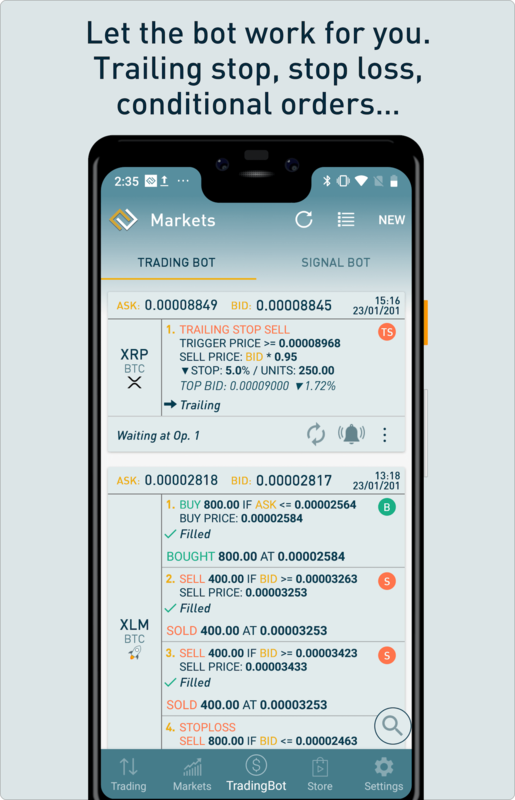 The best free mobile client for quick trading with bot premium features! Place Stop Loss and Trailing Stop Orders with the app trading bot. Great for beginners, amazing for experts. 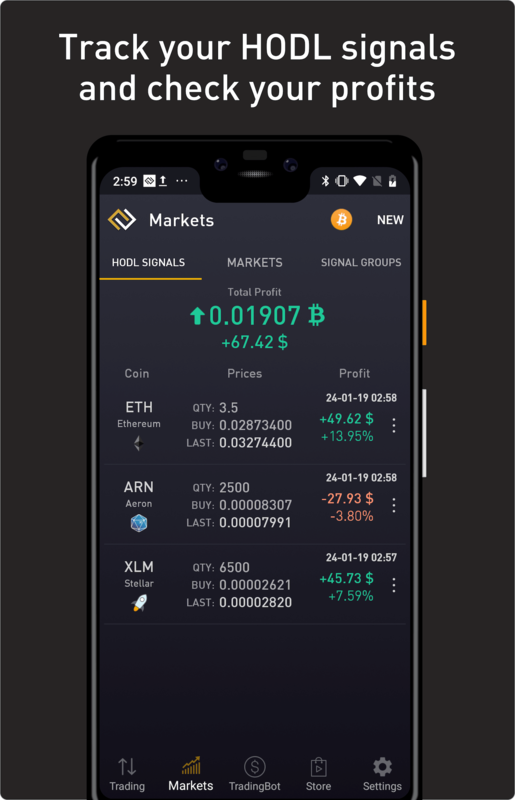 Available for Binance, Bittrex, Kraken, HitBTC, Coinbase, Poloniex, Huobi, Bithumb, Cryptopia and Yobit. More exchanges coming! 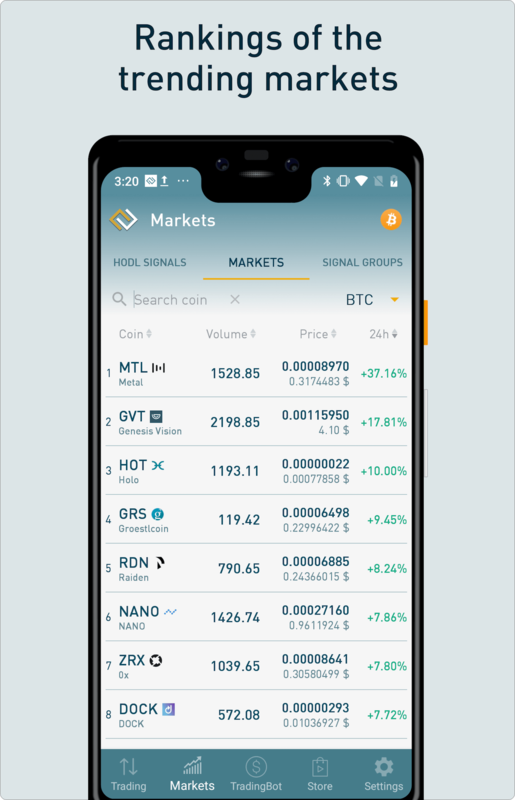 The app is a full exchange quick client with the following FREE sections. A full list of all the currencies in your wallet with their BTC and FIAT equivalences and the total Bitcoin amount. The best place to control your cryptocurrencies. A complete list of all your open and closed orders, with creation and filled date. Full chart of each coin, with prices and volume history with time range customization. This is a must tool for trading. You can also track BTC realtime chart. Manage your hodl signals and track your benefits, coin buy price, amount, coin last value, signal date and coin increment. Add signals directly from your bought orders in Orders section or place them manually with the coin selector. Every signal has a direct access to its detailed chart. Check the trending markets with most benefits in last 24h. Order them by increment, price or name. Get profits with conditional orders using TradingBot. 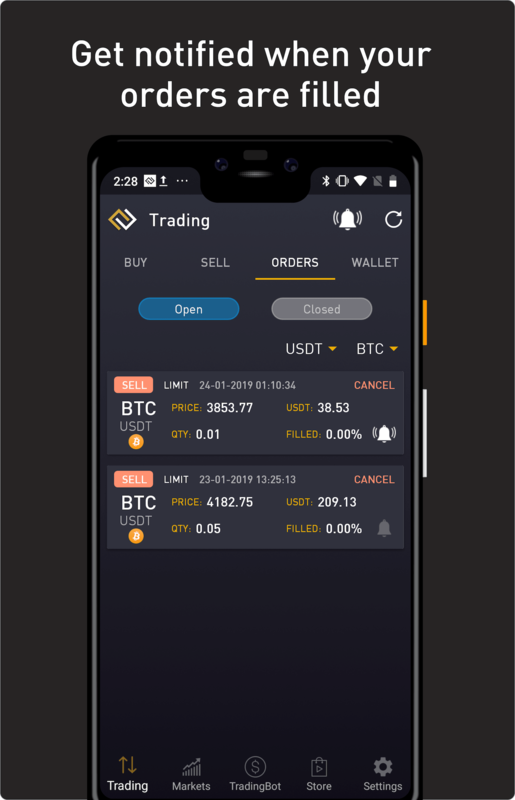 Configure the market, the coin and the buying and selling prices and let the bot place the orders for you, so you just have to wait and get your profits. Place an optional stoploss to be able to control disadvantage market conditions. 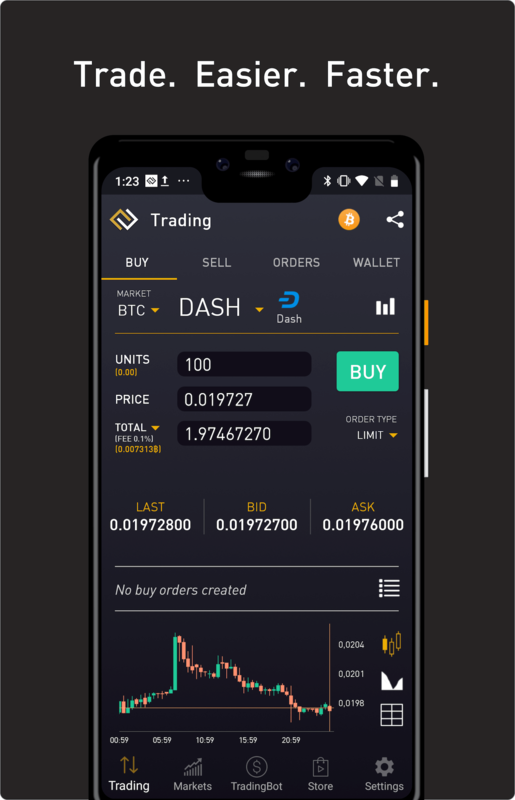 Get the ability to trade with coins that you don't even own yet!. Now with TRAILING STOP orders! 1. Create a BUY order for 3600. 2. Wait until this order is filled. You should have to check by yourself several times if the BUY order is filled. 3. Once the order is filled, place a SELL order for 4000. 4. Wait for the sell order to be filled. With the trading bot, you configure a BUY order for 3600 and a SELL order for 4000 and don't do anything else. It's important to say that the bot lets you create a SELL order with coins that you don't even own yet (as you haven't purchased it at the start of the process). So you can configure it and go to sleep or whatever without you have to enter several times to check your BUY order have been filled to place the SELL order. The bot also works with the app closed. These are some of the operations you can configure with the bots, possibilites are infinite! You can create up to 25 concurrent bots. By default, BUY operations will be associated with <= symbol. That means: "When price reaches <= TRIGGER PRICE, place a BUY order with BUY PRICE for the defined amount of coin UNITS"
By default, SELL operations will be associated with >= symbol. That means: "When price reaches >= TRIGGER PRICE, place a SELL order with SELL PRICE for the defined amount of coin UNITS"
You can configure split sells by adding consecutive SELL operations to your bot, so you can get a better chance to sell your coins. After you configured your first operation, you can keep adding more operations to your bot. Below the units label, you will see two separated quantities. The first one is the currency amount of the coin you own right now, the second one is the currency amount you will add after first operation (if it was a buy). You can also configure a STOP LOSS operation to be safe if the market goes against you. A STOP LOSS operation should always be added after a SELL operation. BID price (at the moment when STOP LOSS is triggered) x MULT value. As opposite of STOP LOSS operation, you can also configure a BUY STOP operation to be safe if the market goes against you (if you thought the market was dropping but it rises). A BUY STOP operation should always be added after a BUY operation. ASK price (at the moment when BUY STOP is triggered) x MULT value. Get most benefit from BTC and altcoins fluctuation with Trailing Stop. This is probably the most powerful order type to get benefits. A sell trailing stop order sets the stop price at a fixed amount below the market price with an attached "trailing" amount. As the market price rises, the stop price rises by the trail amount, but if the stock price falls, the stop loss price doesn't change, and a market order is submitted when the stop price is hit. This technique is designed to allow an investor to specify a limit on the maximum possible loss, without setting a limit on the maximum possible gain. Let the bot auto restart when it finishes all it's operations. Just configure it once and wait to get your profits. TRIGGER PRICE: Defines the trigger price when the order will start trailing. From here sell order will increase it's price if coin price gets high. BID price (at the moment when SELL ORDER is triggered) x MULT value. After you configure the Trailing Stop operation you can check the bot status. Including the top price reached and the current down percentage from top reached. With this feature, you can set the bot to restart when it finishes with profits and without a stop order. This way you don't need to worry about checking if all orders are filled to restart it. And you can take full advantage on BTC and altcoins high fluctuation. Configure it once and start getting profits. Note that as said, it will only restart if last iteration finished with profits and without a stop order. The application also shows you a resume of all times the bot have succesfully completed (cycles). You can check the total profit and the number of times it has completed. You can also see the detail of each completed bot iteration. You can configure the bot to receive notifications when an order is filled or when the bot is completed. You will receive a push notification in your device when an operation is filled including info about the operation.You will also receive a push notification when all operations are finished, including the profit you made. Designed to make money in pump events, just write the coin, buy and sell really quickly with the signal bot. Take advantage from others buying when the price is still rising. 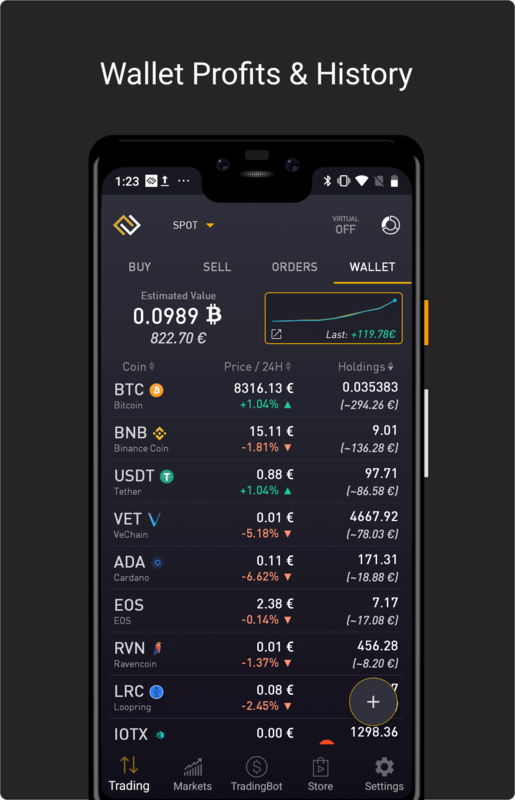 You will love trading with this app. Once you placed the order, the app tells you if it was filled or not. It also prints the current price of the coin in Bitcoin, updating it constantly so you can sell it when it reaches the price you want. Sell orders are also placed with the same speed as buy orders, so you can take advantage to others at your exchange. The bot is fully customizable, you can configure the Bitcoin (BTC) amount to spend and the buy/sell price increment you want to offer from the current coin price. You can also configure if you want to autocancel a non-filled order or not..
Introduce the amount of BTC you want to spend in the buy order. Set the amount of units of a coin you want the bot to place in the sell order. 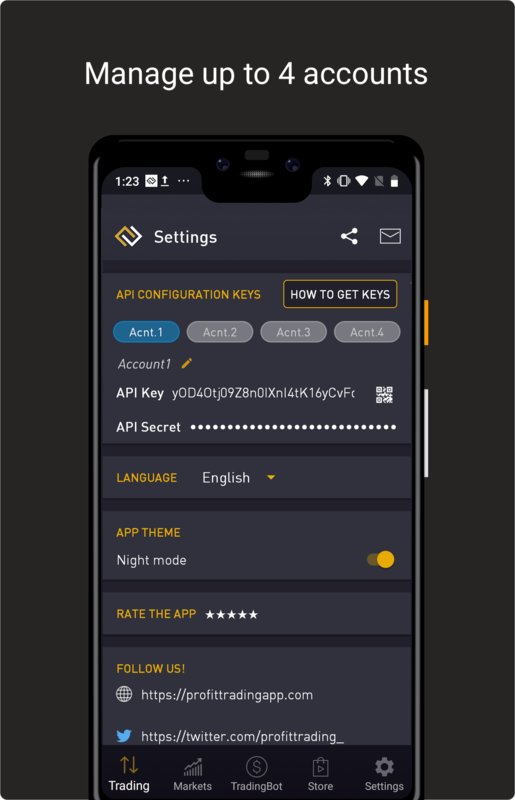 You can see here some screenshots of features of the app. Been using for almost a year. Nothing compares. I can trade anything instantly, I can view wallet, live market, and the trading bot is amazing. I paid over $100 for all options, and pay monthly. Doesn't take long for the app to pay for itself and then some. Truly make money while you sleep... Actually I do wake up most days and find the bot has finished with a successful trade or multiple. I have been using this bot for the past a year. There are plenty of bots available for different operating system, but there are several unique features what makes it worth it's cost. * Decent UI. * Extremely Fast execution of orders * Best and Unique feature of the bots is its Trailing Stop Orders. * Signal bot is another unique feature, which help you generate a awesome profit whenever a coin is being pumped. * Best suited Bot on Andriod for those who don't want to worry with their trade." I had used this app a few months ago and forgotten about it. I came back to it and realized that the devs have been constantly working to improve it. 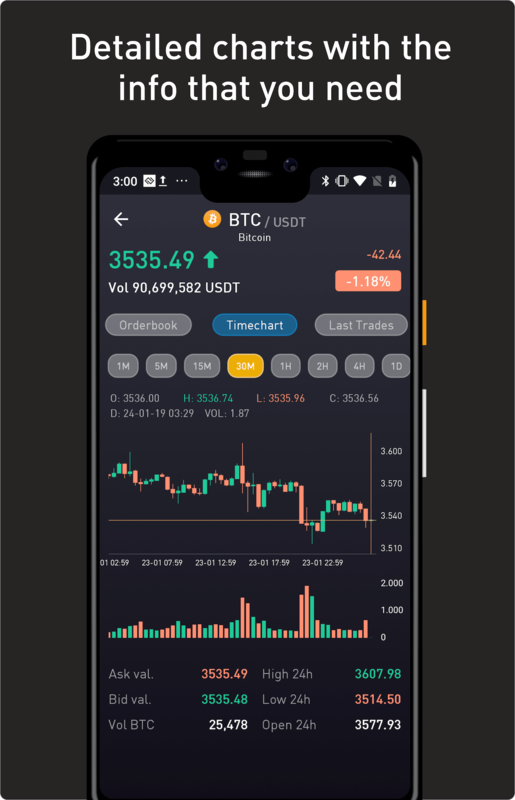 The website was redesigned, app had more features, they started putting out tutorial videos to help amateur traders use the app. I was hesitant to pay the $100 for the trading bot. I reached out to the dev who provided a few days of free trial for me to test the app and get a feel for it. I liked what I saw - made a few dollars profit and cut my losses on failing trades. The trial was all I needed to take the leap forward and buy it. Devs are super responsive and have many thoughts on developing the app and the overall experience as we go. My top favorite feature is having a sell order and a stop loss sell order at the same time. One cancels the other. This absolutely helps reduce user time staring at the charts. Put in all the parameters and configure the bot - that's it! I hope to see updates the same way it has been rolling out in the recent past. Cheers! Excellent. You can make only profit out of it. Great bot, I was hesitating a lot if buying or not because its 140 euros. But in the end I bought it and I dont regret. I really think that you should make a free trial of 3 days or something similar, so people wont hesitate so much. 1. Can I use the app without making any purchase? For sure, most features in the app are free. Bot features are premium as they are designed to make you earn money. 2. Can I purchase one app license and use other apps premium bots? Each exchange app is a different license as they are separated apps, different servers and different maintenance. Bots can also be used same time to make money on each of the exchanges. If you bought one license we offer discounts for the rest of the apps. Contact us to get further details. 3. Do I need to keep the app opened for trading bot to work? No, all TradingBot logic is made on our servers, you don't need to worry about nothing. Just use the app to configure the bots and check your profits. 4. Bots license purchase is lifetime? 5. How many devices can I use with my license? Do you have any question? Maybe any suggestion, promotion proposal or need more info about anything? Send us an email!